The price to pay for being frank. Frankly, this looks more like cat cutlets. A down-to-earth guy, Ground Chuck. I’ll be Frank-oh wait-never mind. I’d rather order the Tender-Lloyd. Waiter: Frank’s stick or Frank streak? Pal-Do World — home planet of “To Serve Man”. Frankly . . . Frank, I frankly feel sorry for you, poor Frank. so this is what they did with sinatra…. For some reason, Pal-Do World, Inc. has new vacancies for warehousemen every week even though it is only a small local supermarket. 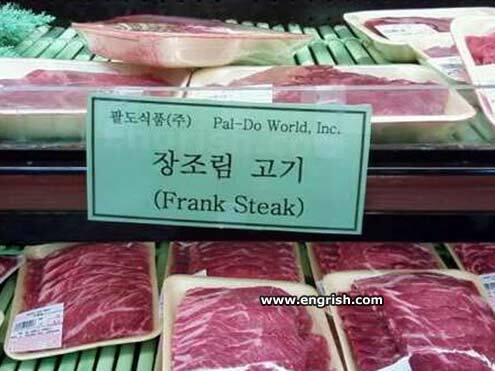 Frank Steak?? Oh. I get it. Flank Steak. Maybe it’s a Lib Loast. “You’re ugly.” It’s not just frank; it’s fresh. In Australia “PAL” is Dog Food. Eat flesh, buy frank steak. I’ll never use Frank’s Hot Sauce again. No pal should do this. Dr. Forrester’s at it again. Oh good. Nothing worse than an insincere steak.